Just regular folks. : Ramen, surgeon, transition, GABA rice. Ramen, surgeon, transition, GABA rice. Memorial day, Jeremy and I went out on a mid-day date where we saw RBG which was fine. It was interesting and generally cheerful & funny, but I was in a bad mood all day, so I think that dragged my reaction of the movie down. We sat very close to the front of the theatre and so it took up our whole field of view and we had to watch with our necks slightly crooked. I've for sure turned into an old person because now I always bring foam earplugs to any movie and wear them to protect my ears from the loudness of the sound. I usually reserve them for only action movies, but I guess now I use them for regular just speaking movies. 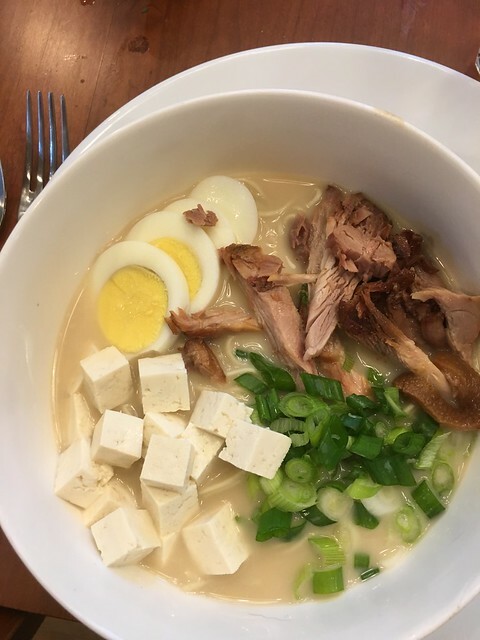 We went to H-mart on the way home to make some ramen (inspired by the YouTuber Vlog after College) which we all enjoyed. Then we went to Edda's transitional meeting to high school at her current middle school. Her whole middle school team told us how well she's been doing and how they are so sad that she's leaving them. I wish I had asked for a group selfie, but I did not. It's been a nice three years, I do love her teacher and he's been her teacher for the whole time we've been in middle school. I enjoy that continuity. We met the coordinator for the high school team and she told us what to expect from a regular school day for Edda. I asked if it was OK to go visit the high school now to meet the teachers, but it turns out they are expanding the program from 2 classrooms to 3 classrooms and one of the teachers is retiring and so they've hired two new teachers and they are not there yet, they are teaching at other schools right now. Edda will go to my old high school, Wootton, and she'll go to a program where she's out in the community most days and they are going to try to teach her to do a job. I know, it's weird. I have no intention of Edda having a job, I want her to have a life of leisure where she will watch movies, drink beer through a straw and take naps next to people who love her, but whatever, they are going to try to get her become task oriented... I dunno. I'm more worried about her graduation ceremony which happens in the middle of the day in a few weeks and I'm trying to figure out how to make it happy & not too sad like the class photos. I think I can ask for her to go first or last in the whole line of getting diplomas. Maybe I can bring Vince to walk her across the stage? With a whole bunch of balloons? Maybe I could walk her out on stage. But if I walk her, there won't be anyone in the audience to cheer for her. Jeremy's out of town and I'm afraid I might bail and not go. Isn't that terrible? I can be terrible sometimes. You need to understand that I know none of the kids or the parents at her middle school. Like no one. This is not my neighborhood school, so these are not my neighbors. 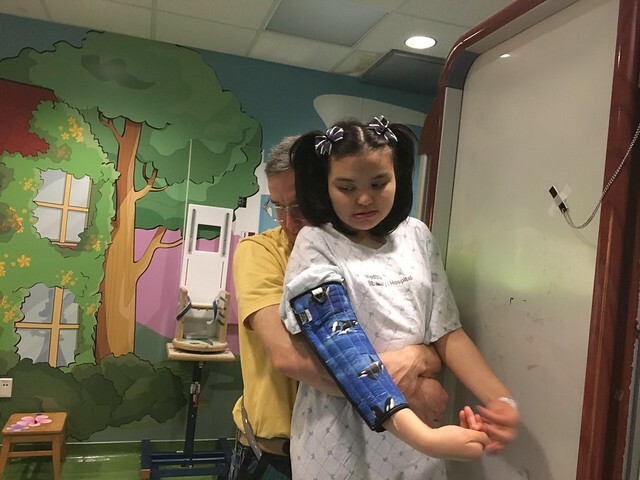 She's the only 8th grader in her teacher's class, she's going to be the only special needs kid walking or rolling across the stage. It could be really kind of traumatic for me. Ack, you know, usually these things that I think will be traumatic end up being OK. I'll figure it out. 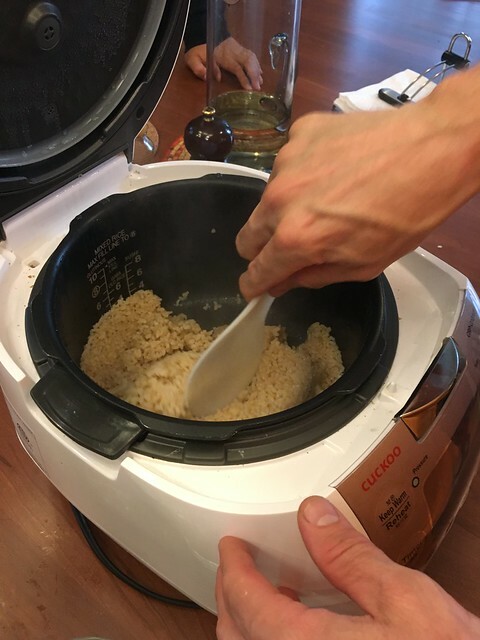 Jeremy made GABA rice tonight in the super smart rice cooker. My bowels feel all healthy and extra regulated. It is funny how the things you think will be bad sometimes turn out okay and others that you wouldn't have thought twice about can just punch you in the gut. I worried about Brooke's 8th grade graduation last year too. It wasn't bad - her teacher walked with her, which was kind of cool. And once Brooke got back to her chair, she promptly fell asleep. Which I found kind of funny because I'm guessing the majority of us in attendance wished we could do the same. I think because they walked up for their certificate one at a time, Brooke's experience didn't seem so different from everyone else. All of the awards handed out after went to maybe 20% of the kids so she was more like the majority of kids in this case. Of course, she had no idea I was even there so if I thought it was going to be difficult, not going wouldn't have bothered her one bit. Resistance, FaceTime, 1000 mile month, cupping. Wound, home alone, road trip. Nat & Edda & Vince. Houseplants, death, Chicago, sleep app. Backtrack. Table, ice cream, bike to work day. Class photos, new kicks, peonies. One eyed giant, table, happy mother's day. Books, Middlemarch, Oryx and Crake. Argh...I want a do over. Foul mood, birthday party, Sunday night dinner. Ziti, Outpost assistant, good night. Orienteering part 2, Maxi bad dog, spring! !